After you’ve created a table in PowerPoint 2013, you can set its style by using the controls under Table Tools on the Ribbon. 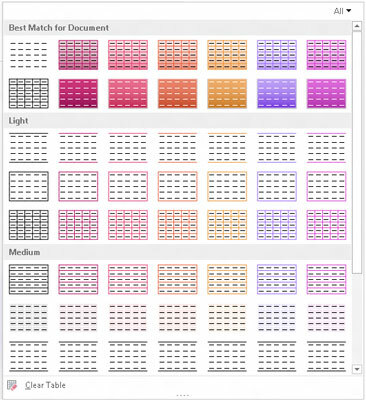 The easiest way to format a table is by applying one of PowerPoint’s predefined table styles. After you’ve set the Quick Style options, you can apply a Table Style to the table by clicking the style you want to apply. If the style doesn’t appear in the Table Styles group under Table Tools on the Ribbon, click the More button to reveal the Table Styles gallery. This gallery displays all the built-in styles provided with PowerPoint. Shading: Sets the background color for the selected cells. Borders: Lets you control which edges of the selected cells have borders.